There are many different types of acoustic transponders. Ultra short baseline systems use high frequency transponders for short range tracking. Long baseline systems use lower frequencies that have a greater range. Photo courtesy of Kongsberg-Simrad. Sound is used to precisely navigate underwater. 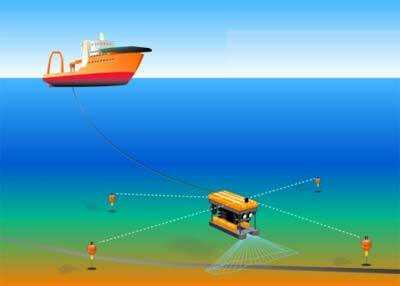 Underwater positioning systems use an acoustic hydrophone or transducer and acoustic transponders. There are several types of acoustic navigation systems, ranging from ultra short baseline to long baseline. 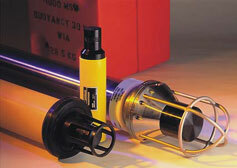 Ultra short baseline (USBL) systems are operated from a surface vessel. An acoustic transponder, operating at a set frequency, is attached to the equipment that is to be tracked, such as a side scan towfish or remotely operated vehicle (ROV). A hydrophone measures the acoustic range and bearing to the transponder. The position of the transponder is determined relative to the vessel. If the exact position of the vessel is known, then the precise location of the transponder can be calculated. USBL acoustic navigation systems are well suited for short range navigation tasks. They typically operate in frequencies of 100 kHz and have a range of 100-500 m.
Long baseline (LBL) systems do not need to be operated from a surface vessel. The transponders are spread out on the ocean floor in known locations, forming an acoustic net. The transducer, mounted on a ship, remotely operated vehicle, or towfish, sends out signals to the underwater transponders. Each transponder responds with a unique sound of its own. These replies are picked up by the transducer. Computers then calculate the exact position of the ship or vehicle by determining the distance from the beacons and using simple geometry and basic math. Once you get three distances from three known points, you can calculate the position using a method called triangulation. Computers calculate the unique point where all three distances measured from the transponders intersect. LBL systems are good for large area surveys, especially in deep waters. They typically operate at frequencies of 8-15 kHz with ranges of up to 5-10 km.